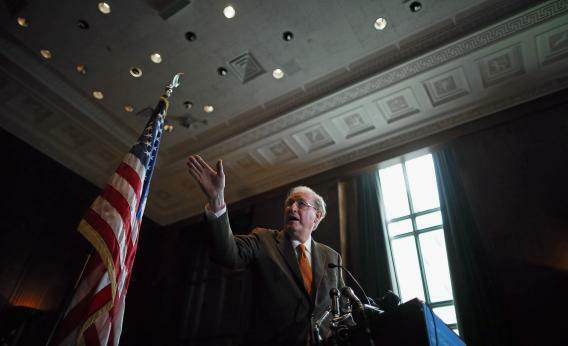 Jay Rockefeller Retires: Can Any Democrat Still Win His Seat? The senior senator from West Virginia will retire after 30 years, citing the “time with my family” reason. “I’ve gotten way out of whack in terms of the time I should spend with my wife and my children and my grandchildren,” he says, though he has one of the least cumbersome trips back home of anyone in the U.S. Senate, and he’ll be 20 years younger than Robert Byrd when he stuck it out. But he was looking his age, walking with a hunch, slowly, in bulky, comfortable sneakers. Rockefeller, a member of the second generation of political Rockefellers (his uncles Nelson and Win made careers in New York and Arkansas), won his first West Virginia office at age 29 and never looked back. He only ever struggled to win an election in 1984, when charmless tycoon John Raese tried to leverage 19 percent unemployment and Ronald Reagan’s coattails into an upset. It did not work, despite a TV ad endorsement from Reagan that Raese would use in multiple subsequent campaigns. Walter Mondale only lost the state by 10 points, and Rockefeller spent enough of his own money ($10 million) to outrun him. Things are worse for Democrats now. In 2012, for the first time, a Democratic presidential nominee lost every county in West Virginia. Straight-ticket voters kept the state’s gubernatorial election close, and gave Republicans historically strong minorities in the state legislature. They won their first state constitutional office – attorney general – in a decade. Sen. Joe Manchin managed to crush a weak candidate (Raese! Seriously! ), but unlike Manchin, Rockefeller had started voicing support for environmental bills. Manchin refused to say whether he’d vote for Obama; Rockefeller had endorsed Obama, early, over Hillary Clinton. He was able to play under-covered roles in Affordable Care Act negotiations, and provide reliable votes for liberal bills. By announcing this now, Rockefeller gives one of the state’s many ambitious Democrats room to fundraise and run. If they’re lucky, the decision will inspire another Republican to jump in the primary against Rep. Shelley Moore Capito. But no likely candidate will have a personal fortune to draw on. The next Democrat who runs will, like Manchin, have to pledge to defy his party whenever it counts. This is one of very few states where a Democrat’s better off not running alongside Barack Obama, but it’ll be a slog. And it’ll move the Senate to the right.